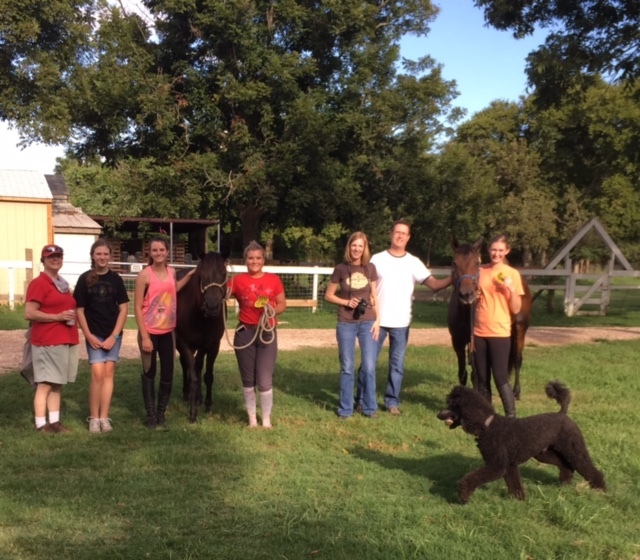 The rescue team of Jo Ann, Olivia, Alex, new pony Jete’, Lauren, Lainie, Hugh, rescue horse Kit and Isabel. Oh, and Kona photobombing the shot. There are all those dog, horse, cat (insert animal) rescue books out today that claim the animal just “found” the person. Then they all had a wonderful happy life thereafter. I don’t believe in fairy tales, or all rescue horses are happy and the perfect fit. I have lived in the real world of animals too long. 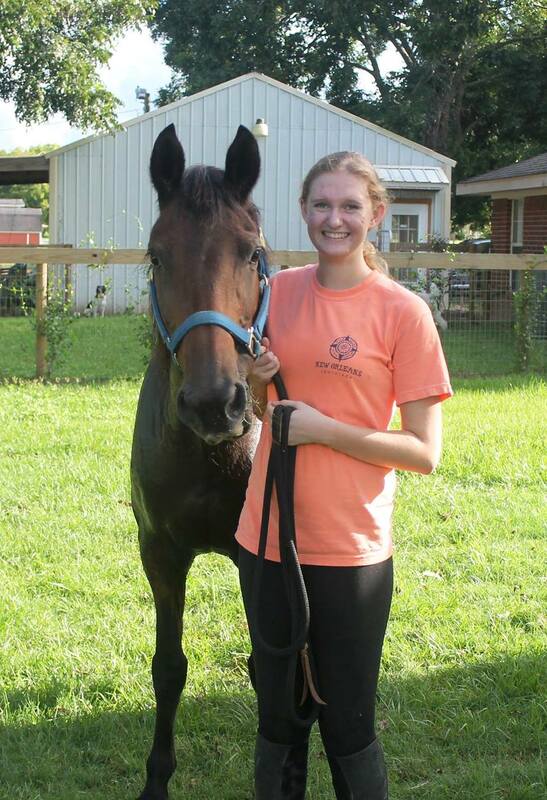 Where my majestic Bruno (an OTTB) is euthanized in my back yard after we suffer the anguish of trying to save him. I have brought home too many “rescue” cats and dogs that later were clearly not the right animal for my family or our lifestyle and had to be re-homed or died on the highway. Maybe all rescue animals go to heaven but the road to hell is stock full of “rescues” gone wrong. I think it is in the nature of a lot of us to want to rescue animals. It makes us feel superior and needed. It makes us feel important. Often we do not think about the long term obligations of the rescue animal that may have a long life to live. 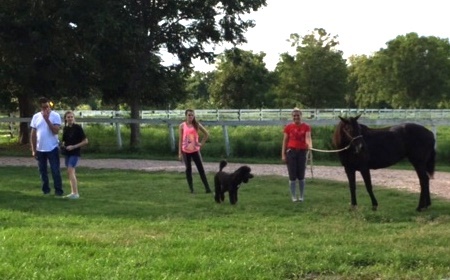 So, with all that negitivity, how did we come to be lined up in the front yard, holding two rescue horses? I guess that doing the “right” thing can be pretty compelling. There might be 15 homes situated on our little bluff over the Brazos River. Most of us have horses, cattle, goats or other livestock and probably all of us have dogs. Our one neighbor lives in a nice, newer home at the top of road. Since we have been here, about a year and a half, we have never seen him. But we have seen his band of five horses. These horses are notorious for breaking out of their pasture. Often they would be seen grazing on the long grass next to the road. That was a good plan because their pasture was overrun with weeds and as our weather has gotten more and more unpredictable this year, the horses have looked worse and worse. The man, Martin, lost his wife a few years ago to cancer and he is elderly. I think the heart just went out of him as he dealt with overwhelming grief and increased dementia. I did not call the sheriff, but someone on the street probably did as I drove home a few weeks ago to see the sheriff’s horse trailer lined up on the road. I knew the horse’s were being seized. About ten days ago, Isabel came up to the house and told me a woman was there to talk to me. She introduced herself as my neighbor, Pauline. It is a sad fact that we do not get out and meet our neighbors in this busy world we live in. I immediately knew her place as she described it. Pauline told me that she and dressage instructor neighbor, Nancy were going to take three of the worst of the Martin’s horses and try to save them instead of having them face euthanasia. Those three horses were elderly and horribly emaciated. Then she asked me if I could help out possibly with the other two horses, both mares, one a younger pony and one a middle-aged Mustang. She said both had been rideable at one time. My immediate thought was no, we cannot take on another thing. It has been a rough year for us after starting the new business, dealing with surgeries (mine and Lauren’s), closing out all my mother’s debts and the difficult weather. A couple of the boarders were standing by and I asked if they could help. Finally, I asked my buddy Jo Ann, always considerate, generous and with a huge heart if she would go hall and half with me on the pony’s expenses and we high-fived in agreement. Of course, I was still trying to sell pony Piper that had not been a fit at all for Jordyn and I don’t know what I was thinking but there we were, agreeing to take a sight-unseen pony while relief washed over Pauline’s face. I asked Lainie if their family might be interested and I got a resounding “no”. I get it. 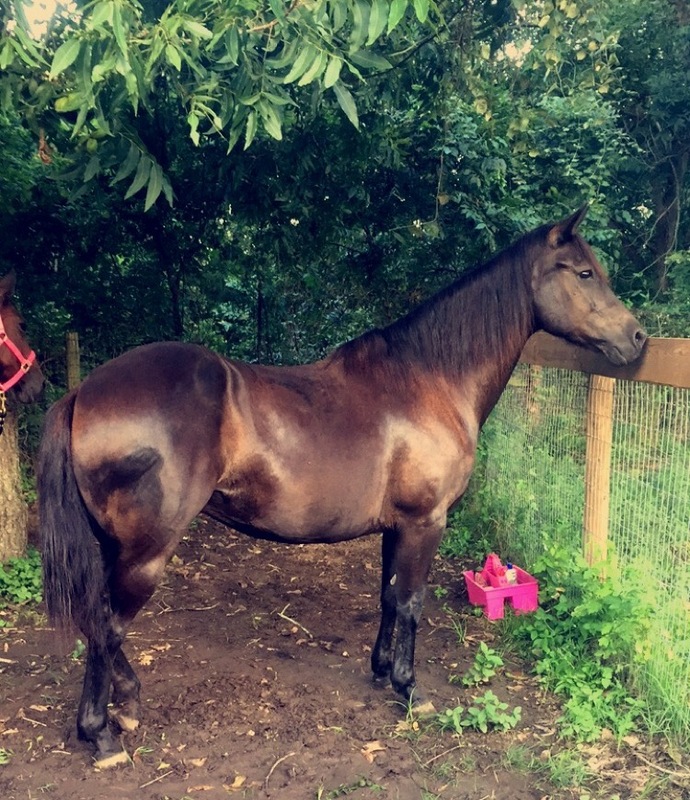 Paying board on an unknown, untested rescue horse is hazardess to your heart and potentially your pocket-book. Later, Lainie’s teenaged daughter, Isabel came to me in the house to ask questions about the mustang mare and how much it would cost to keep her. She wanted to know if she could work off some of the board and expenses. I told her maybe a $100 a month or so. Well. 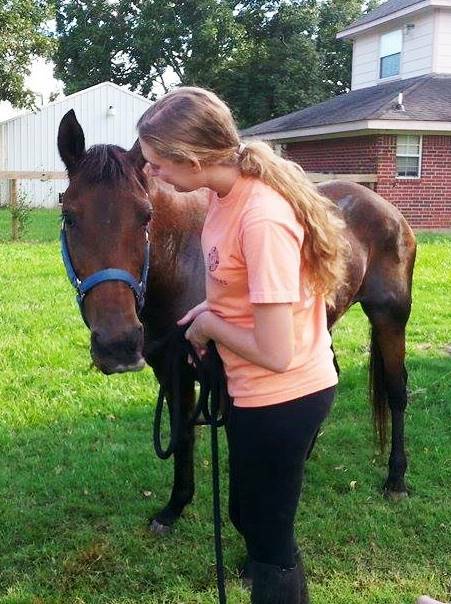 by the next day, Lainie’s family was adopting the Mustang mare. Lainie said she had never seen Isabel so determined (and Isabel is a focused, strong-minded individual on a normal day). They had discussed it as a family, and we worked togerher to come up with a plan to allow Isabel to own her first horse. It was a big moment in her life and one I know she will always remember. Kit arriving, a little thin, a little worn but pretty quiet and eager to please. And then we waited. 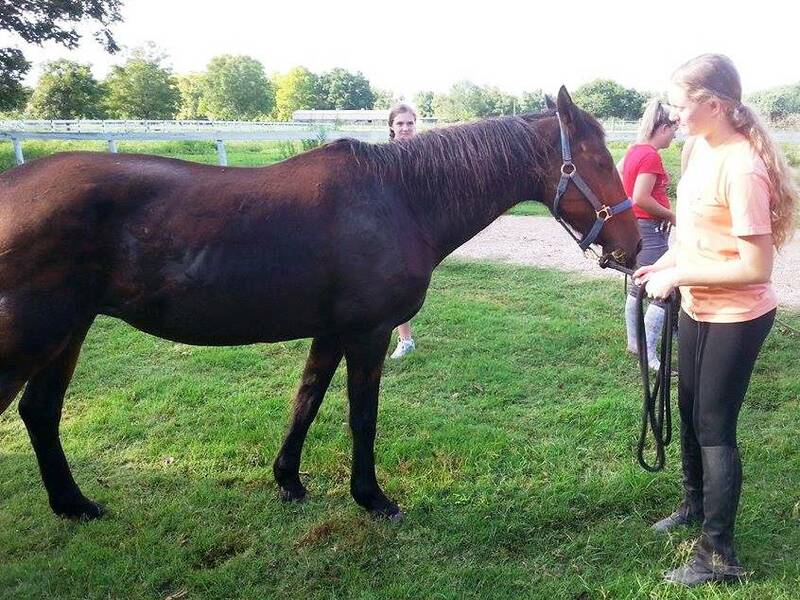 Due to county protocols, the horses had to be quarantined and then sent to an area auction. The auction was set for yesterday. The danger of a horse auction is always the “kill-buyer”. He is looking for horses to buy to transport to Mexico for a horrific death at the slaughter house. Our neighbors had agreed to ante-up the auction cost of the horses if we would agree to give them homes. We expected the horses to move through the auction about noon. At noon, there was still not any sign of them. Pauline called me around 1:30 to say the transport to the auction had been delayed but they thought they would be arriving shortly. Finally around 3:30, we got the news that the two mares had been secured and purchased. But what I thought would be a couple of hundred dollars a piece turned into almost $1000 when the kill buyer went bid for bid with our neighbors. Horse meat goes for about a $1 a pound. A six hundred pound pony brings $600. I was so relieved, I cried when I heard they were in the trailer and headed home to us. Amidst the happy gathering of rescuers, family and friends, the horses arrived safely. The pony backed out to Lauren’s waiting hands and was dubbed with the name Jete’-meaning movement or flight. I hope she learns to take flight over the jumps but who knows, at least she is safe. And in the usual way of ponies, she looked no worse for wear. She looked well fed and stocky. No wonder the kill buyer wanted her-she was a meaty girl. Alex and Lauren holding Jete’ as they wait for Kit to unload. Of course, Kona is on the job making sure all is going well. Isabel and Kit were introduced and both seemed to glow with happiness. One at finding her first horse and one at having finally her own person. Thinner than the pony but with a happy expression and an interested look. We will see how this all works out in a few months or years. Mickey, Snow and Cody all came from the rescue and grace our barn. They have been with Libby and us for over 12 years now. We will see how these ladies do. I bet they get a lot love and groceries and second chance on life. Thank you for riding along! And a big thank you to these new neighbors of mine who put animals first. Thank you Gil and Pauline. It is a happy day at Six Meadow Farm. jete’ gleaming in the evening light after a thorough clean up by Alex and Lauren. Looks like a show pony not a rescue. Wow!